Dirofilariasis is a helminthic infection caused by filarial parasite of the genus Dirofilaria. It is a common zoonotic disease mostly affecting canines and uncommon in humans. It is endemic to Mediterranean countries, with few reports from other parts of the world. The clinical forms in humans are pulmonary, subcutaneous, and ocular. Ocular involvement is rare. 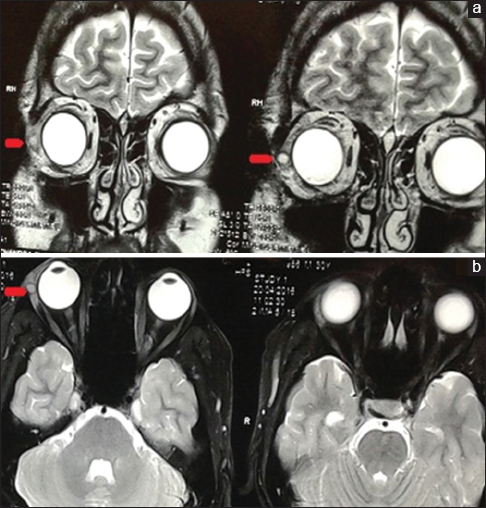 We report a case of lacrimal gland dirofilariasis, an unusual ocular presentation which masquerades as a lacrimal gland tumor. Ours would be the third reported case in the world and first in India. This case was managed with excision of the lacrimal gland mass. Postoperatively the patient recovered completely and there has been no recurrence in the 1-year follow-up. Dirofilariasis is a zoonotic helminthic infection caused by filarial parasite of the genus Dirofilaria, endemic in Mediterranean countries, i.e., Italy, France, Greece, and Croatia. It commonly affects canines, mostly dogs, wolves, coyotes, foxes, and cats, and is rarely seen in humans. It is transmitted to humans through mosquitoes, which are the vectors for Dirofilaria, and humans are the final host of this parasite. The clinical forms in humans are pulmonary, subcutaneous, and ocular. Ocular dirofilariasis is uncommon; however, there have been few reports from various parts of the world. It may present as periorbital, subconjunctival, orbital, or intraocular infection. We report a case of orbital dirofilariasis with involvement of lacrimal gland which, to our knowledge, is the first case of lacrimal gland dirofilariasis being reported in India and third in the world. 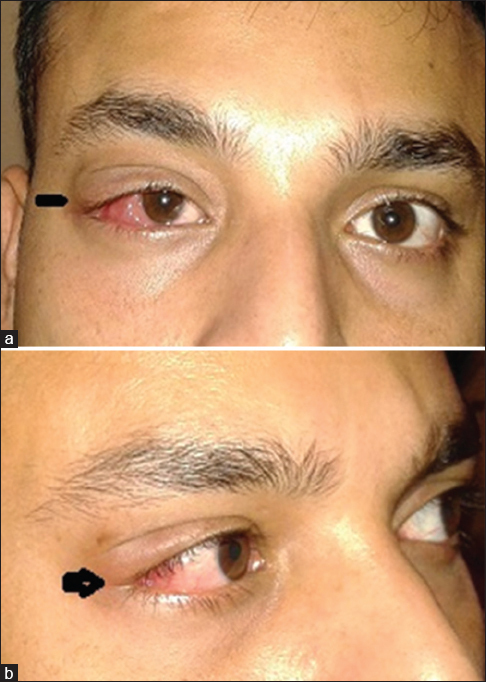 A 33-year-old pilot, resident of Goa, presented with rapid onset swelling, redness, and inability to open the right eye for 1 day. There was no pain except for heaviness in the right eye. There were no other ocular or systemic complaints. There was no history of drug intake, itching, or skin lesions in any other part of the body. There was swelling in the right lacrimal gland area which on palpation revealed a well-defined, firm, nontender mass, measuring 8 mm × 5 mm [Figure 1]a, with no associated lymphadenopathy. Best-corrected visual acuity was 6/6, N6 in both eyes. On slit lamp biomicroscopy of the right eye, there was generalized conjunctival congestion with chemosis [Figure 1]a. Rest of the anterior and posterior segment was within normal limits in both eyes. Systemic examination was unremarkable. A clinical diagnosis of dacryoadenitis or pseudotumor lacrimal gland was made, and the patient was started on oral nonsteroidal anti-inflammatory drugs (NSAIDs). Meanwhile, the standard laboratory investigations, i.e., complete blood count, erythrocyte sedimentation rate, serum angiotensin converting enzyme, chest radiograph, Mantoux test, peripheral smear for microfilaria, stool examination for ova, and cyst, urine routine examination were carried out and all were within normal limits. Absolute eosinophil count was raised (798 cells/μl). Ultrasonography revealed a cystic swelling around the right lacrimal gland. The symptoms started regressing within a week of starting NSAIDs [Figure 1]b; however, the patient was then lost to follow-up for the next 2 months. During this period, he was managed elsewhere, where magnetic resonance imaging of the orbit was done which showed a 5 mm × 4 mm cystic lesion in the lateral part of the right lacrimal gland [Figure 2]. There he was started on tablet albendazole 400 mg with tapering dose of oral steroids for 4 weeks. Patient came back to us after 2 months of initial presentation with complaints of recurrence of symptoms. The mass had increased to 15 mm × 10 mm and was nontender and noninflammatory. Patient was advised excision biopsy. The mass was excised in toto giving an upper lid crease incision [Figure 3]a. It was an encapsulated tumor with no adhesions to the underlying structure and measured 14 mm × 10 mm in size [Figure 3]b.
Histopathology demonstrated a parasite in the central part of the lacrimal gland surrounded by chronic inflammatory cells and significant eosinophils. The presence of thick cuticle, prominent internal cuticular ridges with lateral chords, heavy musculature, and a cavity with few partitions at places and filled with ova/larvae was morphologically matching a parasite of the genus Dirofilaria; most consistent with Dirofilaria repens [Figure 3]c.
The postoperative period was uneventful. The lesion resolved completely with no recurrence in 1-year follow-up. Dirofilariasis is a common zoonosis that rarely affects humans. Although considered endemic to Mediterranean countries reports have been published from other parts of the world as well. The clinical forms of dirofilariasis in humans are pulmonary, subcutaneous, ocular, and rarely infection of the cerebrum, testicles, female breast, invariably leading to an incorrect diagnosis of malignant tumor. Six out of 40 species of Dirofilaria are known to cause diseases in human which are: Dirofilaria immitis, D. repens, Dirofilaria striata, Dirofilaria tenuis, Dirofilaria ursi and Dirofilaria spectans.D. immitis is responsible for pulmonary dirofilariasis, whereas D. repens is responsible for subcutaneous and ocular dirofilariasis. Once the parasite enters blood circulation of definitive host, the adult female helminth, produces microfilaria that is typically found in the peripheral blood. The mosquito takes a blood meal of the infected host and ingests microfilaria. The larvae are injected into human tissues by the mosquito bite. The characteristic feature of Dirofilaria in humans is that the larvae do not survive after crossing the tissues. Those that manage to survive evolve into adult helminth which is reproductively inactive and cannot produce microfilariae. Hence, the infected human will never has filaremia and will always be noncontagious. In the eye, Dirofilaria can be found subconjunctivally,, periorbital (lids, orbit) and intraocularly-anterior chamber, vitreous. During the last decade, ocular dirofilariasis has increasingly been reported from countries previously considered nonendemic such as in parts of South Asia. Periocular dirofilariasis usually presents as an inflammatory mass lesion and the differential diagnosis includes pseudotumor, dermoid cyst, and infectious abscess. The case reported here presented with lacrimal gland swelling with signs of local inflammation in the form of lid swelling, conjunctival congestion, and chemosis. As Dirofilaria is reproductively inactive and there is no filaremia as in other filarial worms, antihelminthic drugs are not indicated. Surgical removal of the parasite or excision of the encapsulated mass with the parasite within is the only treatment for ocular dirofilariasis. No postexcision systemic workup or medication is required. In our case, we removed the lacrimal gland mass in toto which led to complete recovery. In reviewing the literature, it is apparent that all ocular and periocular sites can be involved. Lacrimal gland dirofilariasis, to the best of our knowledge, has been reported twice, Hong Kong in 2004 and Croatia in 2007. Our case would be the third in the world and first in India. There has been a previous case report from India in which the tissue around the lacrimal gland was involved. Lacrimal gland dirofilariasis is a rare presentation which masquerades as a lacrimal gland tumor, and surgical removal of the parasite is the only appropriate management. Aspock H. Dirofilaria and Dirofilariasis; Introductory Remarks; Proceedings of Helminthological Colloquium, 14th November, Vienna: 2003:5. Tavakolizadeh S, Mobedi I. Orbital dirofilariasis in Iran: A case report. Korean J Parasitol 2009;47:397-9. Pampiglione S, Rivasi F. Human dirofilariasis due to Dirofilaria (Nochtiella) repens: An update of world literature from 1995 to 2000. Parassitologia 2000;42:231-54. Melsom HA, Kurtzhals JA, Qvortrup K, Bargum R, Barfod TS, la Cour M, et al. Subconjunctival Dirofilaria repens Infestation: A light and scanning electron microscopy study. Open Ophthalmol J 2011;5:21-4. Chopra R, Bhatti SM, Mohan S, Taneja N. Dirofilaria in the anterior chamber: A rare occurrence. Middle East Afr J Ophthalmol 2012;19:349-51. Gorezis S, Psilla M, Asproudis I, Peschos D, Papadopoulou C, Stefaniotou M. Intravitreal dirofilariasis: A rare ocular infection. Orbit 2006;25:57-9. Chopra R, Panhotra BR, Al-Marzooq Y, Al-Mulhim AR. Subcutaneous dirofilariasis caused by Dirofilaria repens. Saudi Med J 2004;25:1694-6. Yuen KS, Tse MW, Choi PC, Chan WM, Lam DS. Unusual presentation of dirofilariasis as a lacrimal mass. Eye (Lond) 2004;18:959-60. Juri J, Kuzman T, Stiglmayer N, Tojagic M. A case of lacrimal gland dirofilariasis. Ophthalmologica 2007;221:204-6. Mahesh G, Giridhar A, Biswas J, Saikumar SJ, Bhat A. 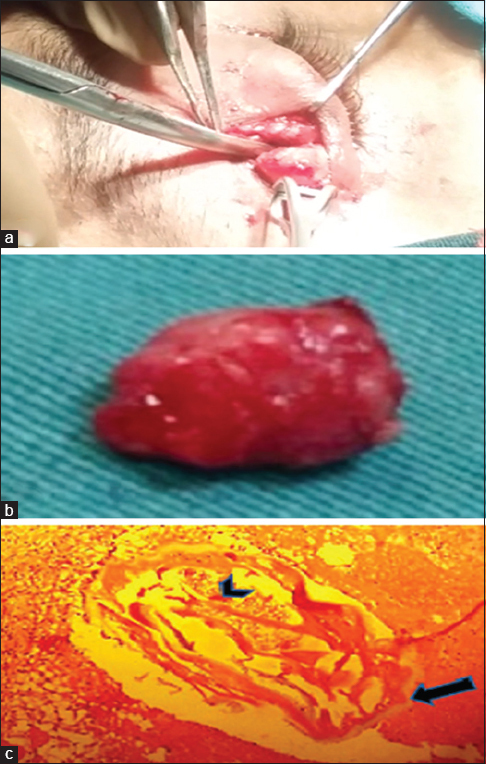 A case of periocular dirofilariasis masquerading as a lid tumour. Indian J Ophthalmol 2005;53:63-4.